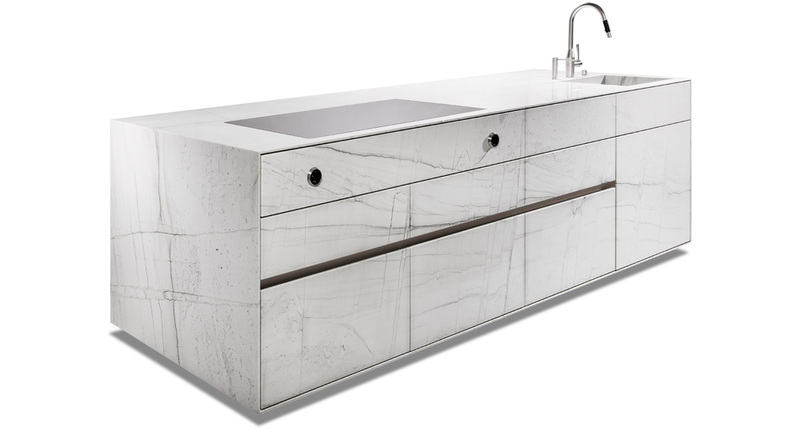 Natural stone, “the salt of the kitchen,” is one of the oldest known materials and dates back to the Prehistoric Age. As the key to comfort, security, happiness and culture, it is the only material that could have withstood the primal power of fire. 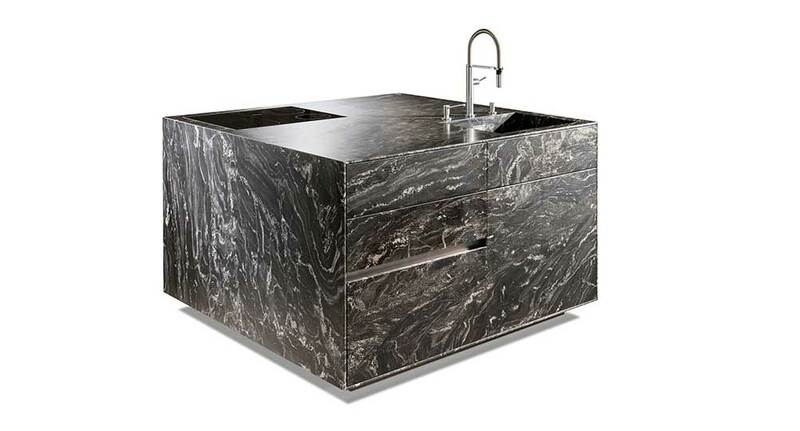 You can choose the dimensions of your ST-ONE kitchen island for all types of stone. Tailored to your individual wishes, flexible dimensions and solid workmanship. Within the ST-ONE parameters, the depth (43 inch standard depth) and length of the units can be sized in line with your wishes. Antarctic is a Brazilian natural quartzite in the shape of marble discovered by STRASSER. The light shade and unique colours remind somebody of the cool elegance that is also found in a glacier landscape. Cosmopolitan is the ideal connection to timeless elegant kitchen design as it is showing a calm structure together with warm brown shades. 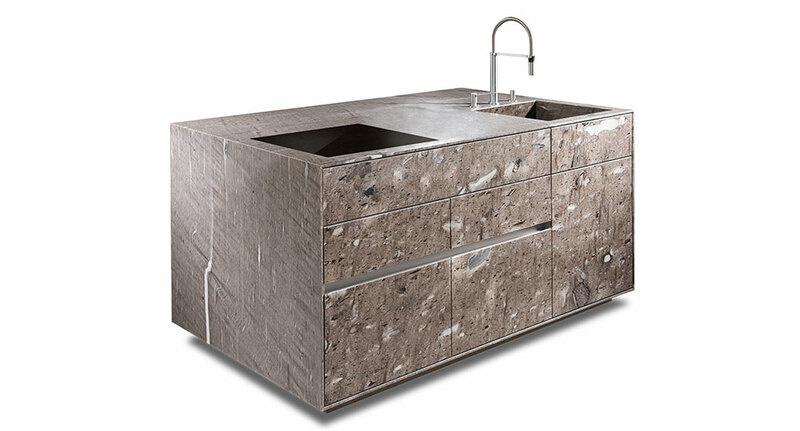 This natural stone with Brazilian origin will fit various kinds of kitchens all over the world. The unique fine marbled granite comes from the depths of the Indian subcontinent. It creates a calm contrast and perfectly harmonizes with metal. It transforms your kitchen into a universe of personal balance. The characteristics of the cool rock formation from the Far East are its special color and elegant structure. As an attractive natural stone block, it combines all the elements of Haute cuisine and breaks the ice into contemporary style. The unmistakable pattern from the tropics of Brazil brings an amazing dynamic into the room. The stimulating structure of the rock brings your room to life with vitality and blends spectacularly well with each type of wood. The tender structure of this Brazilian hard rock is like a copy of the earth. Continents, rivers, mountains and lakes form a universe, that brings dimension and life into the kitchen. With its unique surface, this natural stone sets priorities, which are essential for a unique design. The warm, expressive structure of this South American natural stone brings the power of prehistoric times to the center of your life. Archaic and untamed, it mixes well with conventional kitchen planning. The natural stone fossil is offered only in Cross Cut. 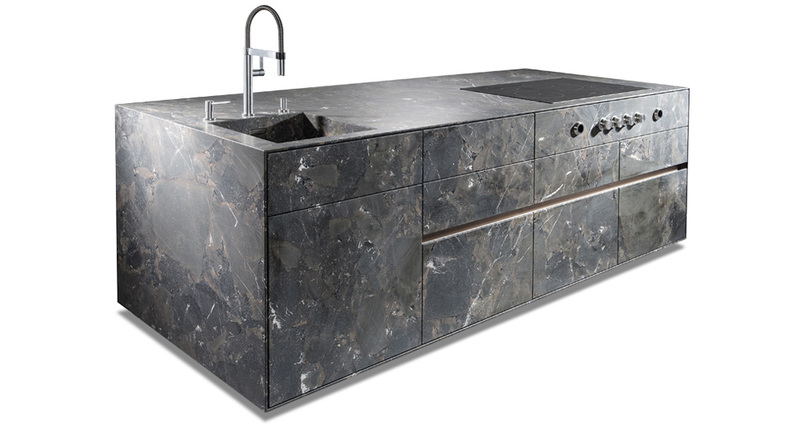 The rediscovery of natural stone as power and as an energy booster in your home is considered a conscious break from the norm, especially in the kitchen. It shows a return to pristine nature which is highly valued today. The ritual of cooking is as basic as a natural element. History shows us there has never been anything better in the past millennia. Your first impression of a ST-ONE kitchen island exceeds your imagination not only by its external appearance but is also matched by its frame: The solid wood drawers with finger joints and cutting edge mechanics are guaranteed to run smoothly permanently. The system is available in Smoked Oak, Natural Oak or Nut, harmoniously blending in with the exceptional natural ST-ONE stones. Various drawer inserts complement the high-quality fittings. The indirect illumination of the recessed toe kick causes an optical floating effect. 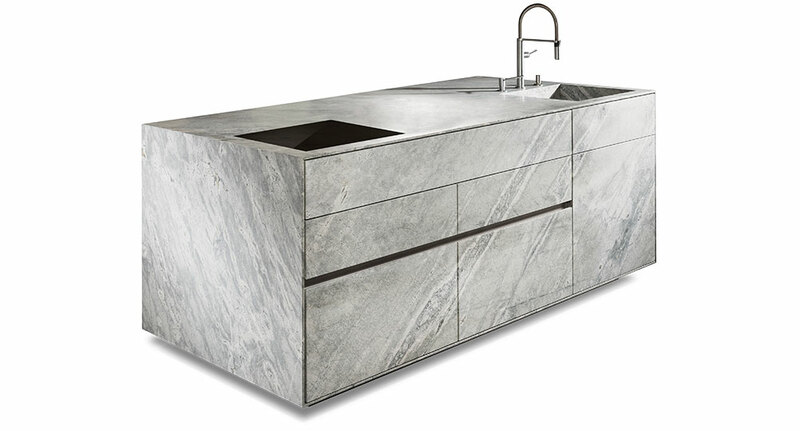 Professionally processed natural stone sink. The dishwasher harmoniously blends in with the overall ST-ONE look. Cover panel, side panels and an additional natural stone covering in the base area are all perfectly mitred. High-quality solid wood frame and drawers are available in Smoked Oak, Natural Oak or Nut with fingered corner joints. The body of ST-ONE is made of high quality multiplex plywood panel. The frame has a stainless steel finish. An optional integrated drawer lighting system illuminates every move. An integrated waste separation system in discreet grey shades guarantees an eco-friendly organizational system in the natural stone island ST-ONE. Paying extra attention to detail, Strasser technique is also reflected in a specially designed socket.